One of my favorite parts of traveling is finding new vegan places to eat. Last night I arrived in Anaheim, California and resigned myself to a dinner at the local Taco Bell. But I figured I should check the Happy Cow app, and sure enough, it delivered in spades! 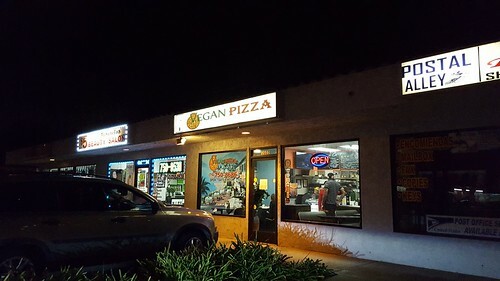 I found a 100% vegan pizzeria about a mile from my hotel called Vegan Pizza. I opted for the walk, to check out the place but was pleasantly surprised they also delivered. I walked up to the little shop in the middle of a nondescript Socal strip mall. 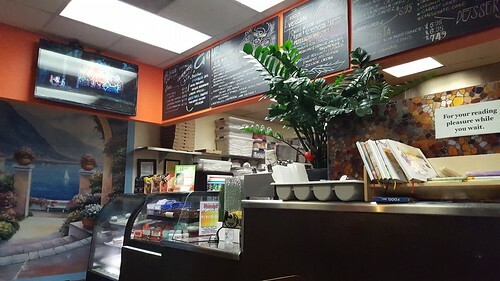 Once inside, the shop was warm, and stocked with vegan snacks like jerky and baked goods. Nice, clean and bright interior. I ordered the BBQ chicken pizza, and an order of cheezy garlic sticks. My order was to go and after 15 minutes I was in the back of an Uber ride on my way back to the hotel for some COPS and pizza. The pizza was absolutely perfect. The crush was doughy but not too much, and soaked up enough of the BBQ sauce to make it extra tasty. The BBQ sauce was thin, but really flavorful. What I really liked about this pie however was that they minced up the gardein into small bits (almost like ground up) and not just slapd of fake chicken. 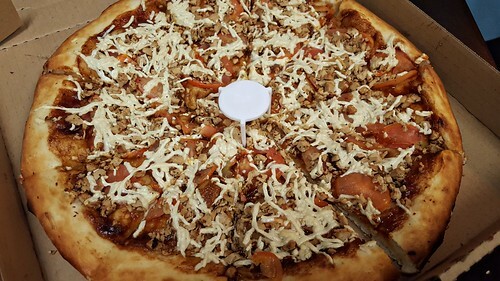 This lent to the weight and flavor of the pizza. It was awesome. 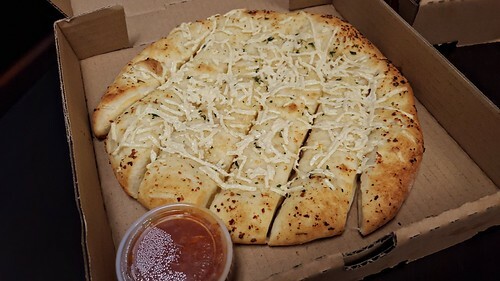 The cheese bread left more to be desired. The daiya was scant as was the flavor. And, the measly dipping sauce needs a larger portion. So, that was a little bummer. I would be lying if I didn’t tell you I ordered delivery a couple of days later. Their site showed delivery, but the calendar was greyed out so I had to use Doordash (which is fine). Overall the whole transaction was effortless. I mean, I still had vegan pizza delivered to my hotel. I couldn’t pry myself from another BBQ Chicken pizza, but this time I added in an order of buffalo wings. I was pretty stoked to try them, as Portland has some pretty awesome vegan wings (ala Veggie Grill, and Fire on the Mountain). 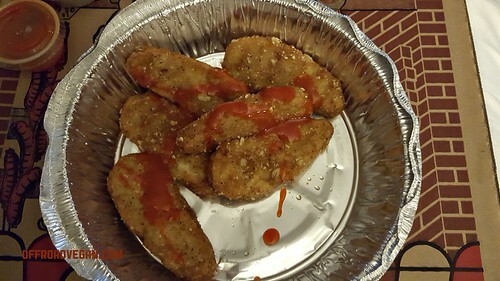 But when I pried open the little tin container, I was FLOORED to see a wimpy portion of Gardein breaded chicken nuggets! The tiny side of buffalo sauce was hardly enough to cover even one of them, let alone a whole flock. So I was pretty bummed. In the end, I was just so happy to find this place. They need to stick to what they are good at – pizza. Just pizza.